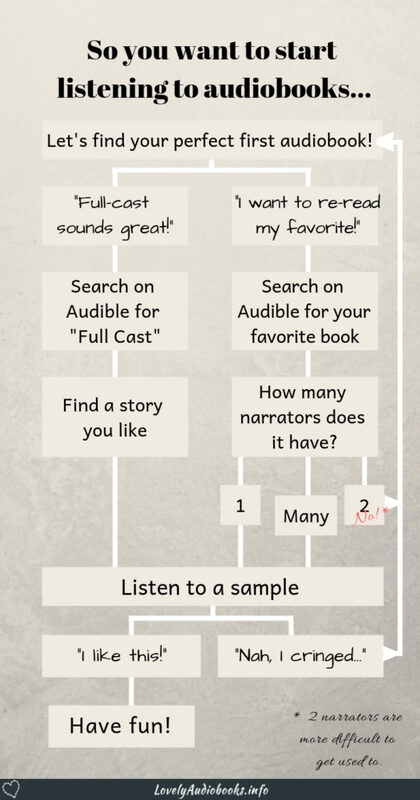 How to find your perfect first audiobook! 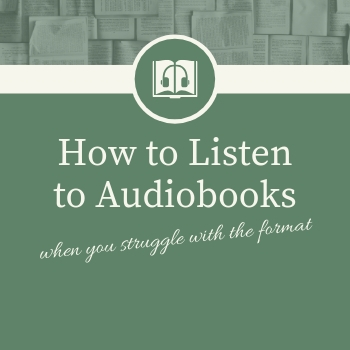 If you ended up here, you are likely aware of most or all of the benefits of audiobooks but struggle with the format because your mind keeps wandering. First off, let me tell you that you’re not the only one! I admit it was a bit of a surprise for me, how regularly people tell me that they have trouble getting into audiobooks. But I can relate to the issue of keeping focussed when listening. I became a regular book-listener about 5 years ago and, for me, it was the resurrection of a childhood thing. As a kid, I always listened to cassette tapes with stories and fairy tales while playing or when going to bed. And I think that made me used to the concept. If you can’t focus, you need a better audiobook! A really good audiobook is the one that YOU truly enjoy. And it will be much easier to listen to. Focussing on audiobooks is something your brain gets used to. After a little while, your mind won’t wander as much anymore (unless you’re really bored by the story or have something important to think about). And you’ll be able to follow the storyline even when doing other things at the same time. Now, let’s find the right one for you…. When trying to get used to this new book format, it’s not the right time to try out a new author. Starting with audiobooks is the perfect time to re-read a story you absolutely love. And if re-reading is a total no-go for you, then it should at least be a book from your favorite author. The more you’re sure you will enjoy the story and be captivated by it, the better for “experiment audiobook”! By the way, if you are a reader of ebooks, Amazon has this nice feature in the Kindle App called Audio Upgrade**. You click on there and get a list of all the audiobooks that are available for the ebooks you own. They are often offered at a reduced price and you can get some audiobooks for as little as $1.99. When picking your audiobook, the way it’s narrated is just as important as the story. So, let’s talk about narration forms shortly. This is like listening to a movie. Every main character is narrated by a different voice actor. Full-cast productions are often abridged (shortened versions) and radio productions. Consider this “full cast light”. In duet narrations, a male voice actor narrates all male sounding characters and a female narrator all the female sounding characters. This is the most common form in romance. The books often have two points of view and since each narrator just does her or his part in their own studio, this is easier to produce than the previous forms, which require narrators to record together in one studio. However, this is also the form that I found the most difficult to get used to since the characters sound different in each chapter. I recommend passing on dual narration audiobooks until you feel more comfortable with the format as a whole. This is closest to having someone read a story to you. Depending on the narrator, they might do more voice acting or more reading. Now, for beginning listeners, I recommend either a full-cast or a single narration book. Some people find it easier to focus on just one voice. But if you often follow TV shows without actually looking at the screen, full-cast might work best for you. Of course, your favorite book is probably not available in your preferred narration form. Full-cast stories, for example, are somewhat rare in comparison to dual or single narrators. Just look up a bunch of your favorite books on Audible and see how they are narrated, or search for full-cast productions on Audible if this narration form caught your eye. Don’t buy any audiobook without listening to a sample! Especially when it’s only one or two narrators you need to make sure you like their voices and narration style since they can differ immensely and depend on personal taste. You can find the button on both Audible and Amazon right under the audiobook cover. Decide if you rather want to re-read a favorite story or try out full-cast. If you decide you want a re-read, search for the book on Audible. If your favorite is a dual point of view story with two narrators, please consider only picking that one up later on. Really, dual narration is more difficult to follow. And if you know you struggle with focussing on audiobooks, it’s worth investing a little more time into finding your perfect first listen. Your brain will get used to the format pretty quickly and it will get easier to actively listen and follow alternating narrators. Once you found a book, check out the sample. Do you 100% love the voice and narration style? Then it’s a winner. But if you don’t, rinse and repeat. Find a different book, listen to the sample. If you decide you want to give full-cast a try, put that term into the Audible search bar. You’ll get a bunch of hits of BBC radio productions and other full-cast audiobooks. Just browse around and find a story you’re sure you will like. Listen to the sample to make sure you enjoy the sound of the voices and that it’s a good production. We are all creatures of habit. It isn’t a weird thing at all to not fall instantly in love with the concept of audiobooks. But if you want to increase your reading time and have boring commutes or chores that you would like to make more interesting, audiobooks are absolutely perfect. Great post! 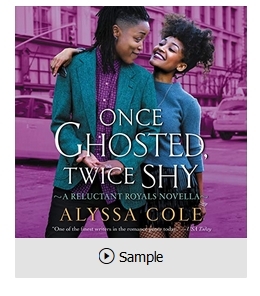 I love to upgrade my kindle books to the accompanying audiobooks and I always make sure I listen to a sample before buying. That’s great 🙂 Thank you so much for stopping by! I love this post. You inspired me to try audiobooks and I love them. You really champion this community and support people to find the right books. Aww, thank you 🙂 That really means so much to me! Thank you for your comment 🙂 I hope you’ll find some audiobooks you love! They can be a great way to get more reading done or finish a book you don’t get around to otherwise. You read my mind! I don’t like listening to the radio when I’m driving, but I can’t concentrate on audio books. Great ideas as I head into a long road trip. Thanks! Thank you so much for sharing—this is a great list! I have never been able to get into audio books or podcasts, and it has felt as though I’m missing out on something special. This makes it seem more approachable. I’ll definitely give it another go! That makes me so happy to hear 🙂 I hope you find something you like! I completely love this approach! The struggle with dual narration is REAL!! 🙉 I always prefer one narrator over the other and can’t get past it. I haven’t actually listened to a full-cast yet but would like to! I’m really used to dual now, but it took me a long time. It was just so odd for me with the male narrators doing female voices. Full-cast is so good! You should really give it a try. I will definitely!! And yes I agree with male narrators not executing feminine voices well… for some reason I like the opposite unless it happens to be one of my favorite narrators! I have listened to few audiobooks via Read Me Romance podcast. Before I knew about this podcast I was strongly against audiobooks but I found that they can be very quick, enjoyable reads. I agree that if your mind wanders you need to pick a better book. I think I’ve listened like three or four books and my mind wandered only once.